Industry investment in seed innovation and productivity in your fields – we can all agree the success of one depends on the other. 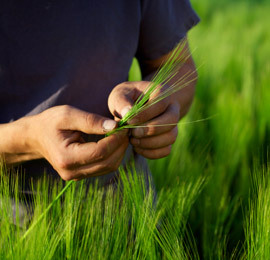 According to a recent survey, Canada's seed companies will invest over $106 million in R&D in 2012. Canola, corn and soybeans – the three crop types that are providing Canadian farmers with the most varietal choices and highest net cash returns per acre – will receive 96% of this projected investment. Something we may not often think about is how intellectual property (IP) protection and a farmer's investment in certified seed impacts industry investment decisions in plant breeding and research. 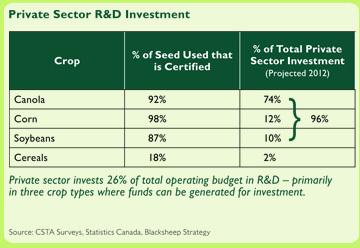 The chart on the right demonstrates this link – industry is investing the most in the three crop types where certified seed use is the highest. It takes many years and a tremendous financial commitment to bring a new variety to the marketplace. Conventional plant breeding can take up to 13 years from the first cross to a commercial variety, and it can cost over $10 million to develop and commercialize one new genetically modified canola hybrid. Private sector R&D investment can only occur if these costs can be recovered. Your purchase of certified seed and respect for intellectual property protection generates the funds for future investment. We can see what happens when certified seed purchases are low and effective intellectual property protection is not in place – we just have to look at Canadian wheat. Wheat yield gains in Canada are among the lowest in the world. Let’s examine a few intellectual property protection systems and their role in fostering investment and innovation. Law requires that only seed of a pedigreed grade can be advertised for sale or sold by the variety name. With PBR, developers of plant varieties have an opportunity to recover their investment in research, typically through a royalty of 5-8% of the cost of seed – just cents on a bushel to support continual innovation. These are signed agreements between you and the seed company that set the terms for purchase. Granted by the government, patents protect the creator’s invention from being copied for a specified period of time, allowing the inventor to recoup some of the costs of development. Canada allows patents on gene-based traits and eligible plants; varieties cannot be patented.